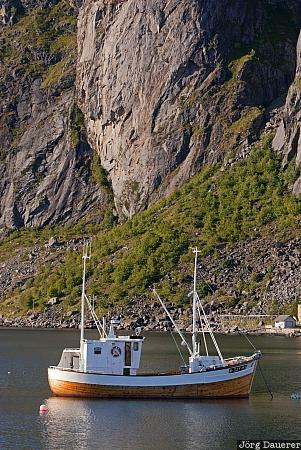 A lone fishing boat in the Norwegian Sea near Hamnøy with steep mountains of the island Moskenesøy in the background. Moskenesøy a part of the Lofoten archipelago, Nordland in northern Norway. This photo was taken in the afternoon of a sunny day in August of 2010. This photo was taken with a digital camera.